What Does the ENERGY STAR® Certification Mean When Buying a Dehumidifier? 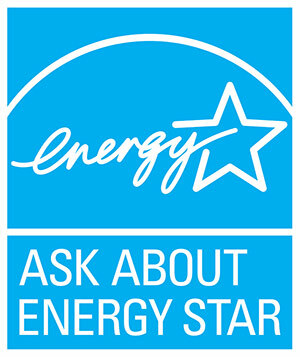 Since its launch in 1992, the ENERGY STAR® program has grown to establish specifications for all kinds of products, from computers and electronic equipment to lighting, appliances, new homes and more. But what does an ENERGY STAR® certification mean when you're buying a dehumidifier? Dehumidifiers are designed to remove moisture from the air by blowing air over aluminum coils that are cooled with refrigerant. Cool air can't hold as much moisture as warmer air. When humid air contacts the cold coils in a dehumidifier, it gives up moisture in the form of condensation. Dehumidifier capacity tells you how many pints of water the unit will remove from the air over a 24-hour period under "standard" conditions -80degrees F and 60% relative humidity (RH). It's important to note that "standard conditions" aren't what you encounter in a basement, where temperatures are significantly cooler and humidity may be higher. A room-size dehumidifier might have a capacity of around 30 pints per day (PPD). In contrast, a SaniDry™ Basement Dehumidifier has 109PPD capacity. Dehumidifier efficiency is usually referred to as the Energy Factor (EF), which is based on the amount of water (in liters) the unit can remove from the air per kilowatt hour (kWh) of electricity consumed. The larger the number, the more efficient the dehumidifier is. Larger dehumidifiers tend to be more efficient. Coil comparison. The cooling coil assembly used in a SaniDry™ dehumidifier resembles a car radiator and provides an immense surface area for condensation to take place. In contrast, the compact coil on a cheap model is undersized for basement dehumidification requirements. Dehumidifiers with a capacity of 75PPD or less must have at least a 1.85EF to earn the ENERGY STAR®. Models with 75-185PPD capacity must be 2.8EF or higher. These minimum efficiency ratings are at least 15% better than those for standard dehumidifiers. In addition to meeting minimum EF requirements, ENERGY STAR® dehumidifiers must be equipped with an adjustable humidistat control (which allows you to set your target humidity level) or be operable using a remote humidistat. One reason that larger dehumidifiers can operate more efficiently than smaller units has to do with the size and quality of components. 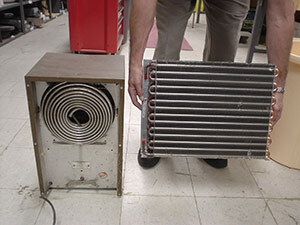 For example, the compact circular cooling coils on a cheap, room-size dehumidifier present a much smaller cooling surface area than the radiator-like cooling coils used in a SaniDry™ dehumidifier (see photo). As a result, the smaller unit's fan must blow a huge volume of air through the machine to match the dehumidification capacity of the larger unit. This translates to more electricity consumption. It's important to learn about dehumidification before purchasing a dehumidifier for your home.